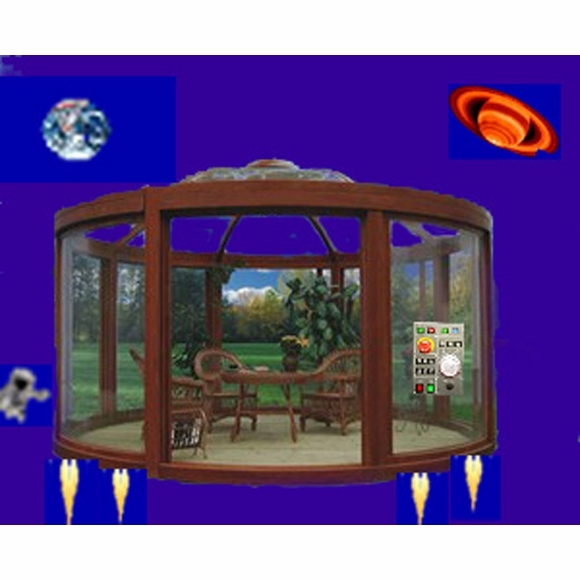 Personal Outerspace Transport Vehicle - - Read, write, relax, entertain, or simply enjoy the view from our Personal Outerspace Transport Vehicle (POTV) that harmonizes with your surroundings. Can be assembled by a two-person team in two days. FAVORITE COMFORT FEATURE: This stunning and almost-instant 130 square-foot vehicle has a single control panel that operates all functions with ease. Virtually no learning curve required. Suitable for short range trips and long range journeys. Made of the highest quality aluminum with wood tone finish and clear polycarbonate sections. Eight curved sections: one slides open for entry/exit and the other seven are fixed. Clear panels made of 8cm polycarbonate. All parts meet EN 14080 and EN 386 standards. Can launch and land directly on flat ground. Does not require a concrete slab (which saves on setup costs and may eliminate the need to obtain a landing permit depending on your municipality). Air vent under dome ensures circulation when grounded. Includes thermodynamic wind driven fan. Rated for 140 MPH winds. 40 pound/square foot snow capacity. Dimensions: 14'1" diameter x 6'7" high side wall/9'10" high center; weighs 3000 pounds. 5-year mfg. warranty (however, maintenance by owner is required). Hollow vertical posts can be used to hide electrical wiring for permanent installation of additional lighting, a sound system, television (although reception from space is poor), heater, hot tub, and other creature comforts. This item requires truck delivery. Curbside delivery. This was our 2015 April Fool's Day prank product.